The Public Accounts Committee said there was a “moral responsibility” to pay these workers. THE PUBLIC ACCOUNTS Committee (PAC) has heard that the 58 staff members who worked on a contract basis for the liquidated charity Console have not been paid, and are “unlikely to receive monies owed to them”. In a statement today, the committee chairman Seán Fleming said that while there is no legal responsibility for the government or the HSE to step in, there was a “moral responsibility” to ensure these workers got what they are owed. I am saying we cannot let this go… this committee showed grave concern for the staff and the service they offered. For us to walk away from the staff at this stage – we would be shallow people. The HSE rejects any suggestion of negligence in relation to Console. We took all steps within our legal powers to deal with the issues which emerged. While the HSE empathises with the staff concerned, it is likely that there would be legal exposure for the HSE if any payment, including ex-gratia payments, were made. 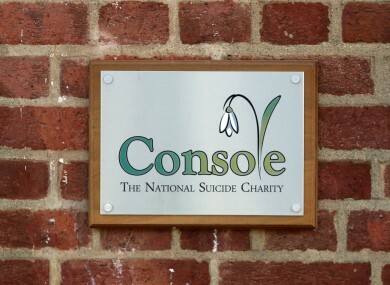 Console provided a range of services including a 24/7 suicide helpline, a suicide bereavement liaison service, and a suicide bereavement counselling service. The charity was wound down last year after it emerged through an investigation from RTÉ that its founders spent donated money on personal expenses. An audit found that half a million euro was spent on foreign trips, designer clothes, eating out and other expenses between 2012 and 2014 – while another half a million was spent on salaries and cars for CEO Paul Kelly and his wife Patricia. At the time of the revelations, Sinn Féin’s Mary Lou McDonald said that the HSE had serious questions to answer about its role as it was providing direct funding to the charity. Appearing before the PAC in July, the HSE denied that there were any wrongdoings or errors on their part in monitoring the funding of Console. Today, the PAC said that there was a moral obligation for the staff who provided these essential services for the charity not to be left high and dry after last year’s revelations. Fleming said: “While there may be no legal responsibility on behalf of the Department [of Health] or the Health Service Executive to pay these monies, given the weaknesses in oversight of the charity by the HSE and delays in dealing with matters in Console, there is a moral responsibility to find a way to ensure that those who worked on behalf of Console… should not be at a loss. The PAC is calling on the HSE to find a mechanism, by means of an ex-gratia payment or otherwise, to ensure that these people are paid for the valuable work they carried out. Fleming added that the PAC would write to both the HSE and the Department of Health over the coming weeks to ask them to “reconsider their approach to this matter”. Email “Staff at liquidated charity Console still haven't been paid and it looks like they never will be”. Feedback on “Staff at liquidated charity Console still haven't been paid and it looks like they never will be”.